There were so many tribes of Native American Indians it is only possible to generalise the most common meaning of the Lightning symbol or pattern. Native Indian symbols were used for a variety of reasons and depicted on numerous objects such as tepees and clothes. 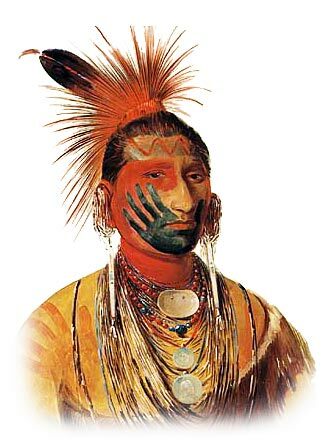 In the instance of the Lightning this was a common symbol that was painted on the face of an Indian, as in war paint, as seen in the picture on this page. The meaning of the Lightning symbol represented lightning which was believed to add power and speed to the warrior. Lightning and the zig-zag symbol, painted in red, is also associated with the legendary Thunderbird. The Thunderbird is a powerful spirit in the form of a supernatural bird from which lightning flashed from its beak and its eyes. Lightening represents the punishment of humans from the Gods a sign of a terrible event - refer to the Hopi Prophecy.